At some point or another in our lives, there’s a very high likelihood of developing an issue with infected hair follicles. It’s not something to be embarrassed about – it’s just a fact of life. Too often though, infected hair follicle issues are swept under the rug or dismissed as unimportant. This is dangerous, and can lead to wide-ranging, long-term, and sometimes irreversible hair care issues in the future. In addition to well-known diseases of the hair follicle such as alopecia, the hair follicle can also become infected in a variety of ways. An infected hair follicle is known as folliculitis. Folliculitis is most commonly a bacterial or fungal infection, that may present itself in the form of white-and-red bumps which look like pimples. Other symptoms include having a persisting itch or rash, as well as painful skin. Understandably, these infections make people feel uncomfortable – physically and emotionally. It’s important not to be embarrassed by these infections. We need to understand that infected hair follicles can affect even the most hygienic people. Having said that, there are still several important risk factors that are worth keeping in mind, in order to increase chances of prevention. The consequences of folliculitis have the potential to be disastrous. They can lead to recurring infections, irreparable skin damage – and even the destruction of hair follicles and hair loss. Luckily, Advanced Hair Studio has a range of solutions and treatments to deal with the fallout of folliculitis. Our online store stocks a range of products like our Laser Hair Growth Treatment, AHS-FP Program or our Stem Cell Program that can put you on the path to successful hair regrowth. 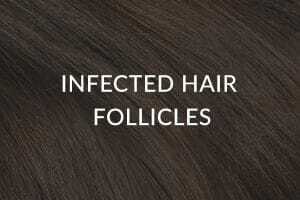 Don’t let infected hair follicles get the better of you. With over 45-years’ experience and 500,000 happy clients around the world, we know how to fix your infected hair follicles. Once you begin treatment with us, you‘ll never look back—you’ll be in control of your appearance and your future.